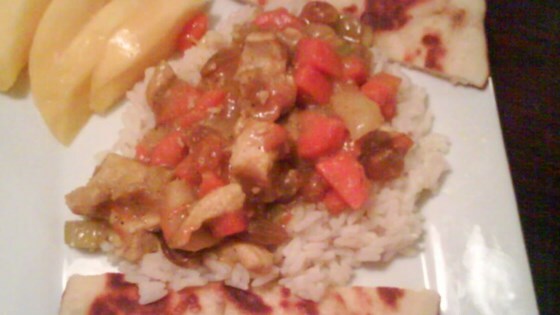 "Sauteed chicken breasts in a coconut curry sauce with vegetables, raisins, and apple. Absolutely delicious! Serve over rice." In a large skillet over medium heat, evenly brown the chicken breast halves. Mix in carrots, celery, and onions. Cook and stir until vegetables are tender. In a small bowl, mix the curry powder and flour with hot water. Blend in coconut milk, forming a thick paste. Mix curry powder paste, remaining coconut milk, raisins, and apple into the skillet. Thoroughly coat chicken with the mixture. Cover, and reduce heat. Simmer 30 to 45 minutes, until chicken is no longer pink and juices run clear. What's cooking in Pearland, Texas? A sweet-and-savory fusion dish.